TruStrip™ is a trademark of Alpha Diagnostic Intl. Inc. for all strip-based products or rapid tests (TruStrip™ STS patent pending). Freeze-drying of samples (lyophilization) is routinely used to preserve integrity of samples and extend a sample's shelf life. Some common examples are milk or coffee powder, protein powder used for human and animal consumption, thousands of common biological samples. However, lyophilization is not well-suited for small samples (10 ul or 100 ul) or complex specimens such as blood. The use of filter paper or other similar products to collect blood samples and subsequent air drying or so called DBS (dried blood spot) is a simulation of lyophilization process and well-suited for small samples. DBS or filter paper sampling has been in use for decades for the assessment of the health status of human neonates for congenital defects such as phenylketonuria and DNA based testing. ADI's TruStrip™ STS is the smart enhancement of time-tested technique of sample collection but designed for protein, antibody-based testing. TruStrip™ STS (sample transfer system) is a novel, smart, efficient, and tamper-proof sample transfer system for collecting defined volumes (15 ul - 400 ul) of samples (blood, serum, plasma, urine, proteins, antibodies, DNA, bioanalytical reagents, chemicals, environmental samples) on pre-calibrated strips, without the need for any measuring devices such as a pipette. Any sample that is being collected, stored, and transported in common tube and vials can be stored and processed on TruStrip™ strips. 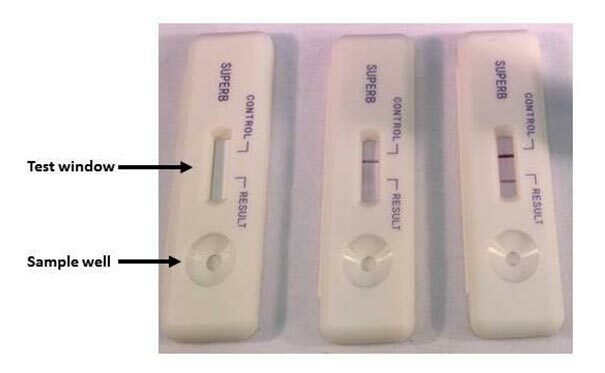 TruStrip strips will hold true volumes (5, 10, 15, 25, 50, 100, 200, and 400 ul) of samples in dry state and allow its quantitative recovery when needed. TruStrip strips containing samples are stored and transported in a specially designed storage containers that will organize the strips individually and prevent any contact from other strips and protect it from damage as well. TruStrip™ strips along with its storage container (TruStrip™ tray) constitutes the TruStrip™ STS. Anatomy of a TruStrip™ RDT. What is the optimal sample volume for use with TruStrip RDT'? The ideal sample volume for use with TruStrip RDT is 100-200 µl. This ensures that there is sufficient volume of liquid for migration across the length of the substrate and interact with the reagents on the substrate. How is TruStrip RDT product stored and supplied? 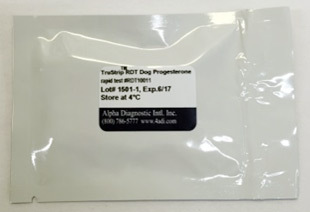 TruStrip™ RDT test cartridges are individually packaged in sealed pouch that protects them from light and moisture. The test cartridge can be stored at room temperature for short periods or stored refrigerated for several months. Each cartridge has an expiration date that is clearly marked on the label. Test cartridges are supplied as a kit along with vials of common buffers and solutions that can be used for diluting test samples if needed. How to order TruStrip RDT products? What kinds of samples are most well-suited for use with TruStrip RDT? Ideally, any liquid sample such as serum, plasma, urine and any other clear buffer solutions containing biological materials are ideal for use with TruStrip RDT. The test results are obtained as a visually observable colored stripes and therefore any colored sample solution that could potentially mask the visual results are not ideal for use. An example would be whole blood. How does one know if a TruStrip RDT product has already been used? Every TruStrip RDT test cartridge is individually packaged in sealed pouch. If a pouch appears to have been opened, it will be visually apparent and it is possible that the test cartridge may have been used or tampered with. Is there more detailed product information available? Is there a TruStrip RDT product informational video?